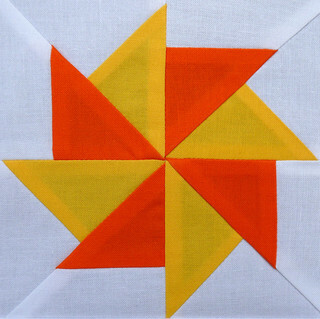 I look forward to a mini (although not necessarily quick) project now and again and enjoyed piecing these pinweel blocks. 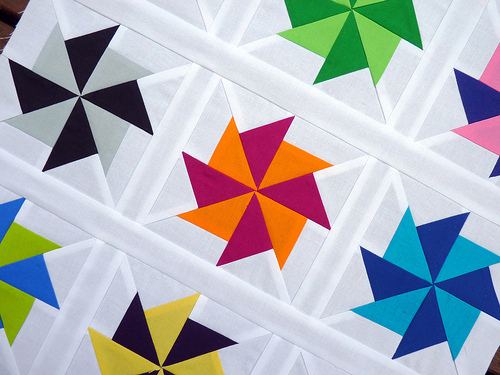 I started my search for inspiration by browsing the Quilter's Cache quilt block gallery and based my pinwheel block on the general layout of Pinwheel #8, although I had to significantly shrink down the block size and re-do the math to make much smaller patchwork blocks. 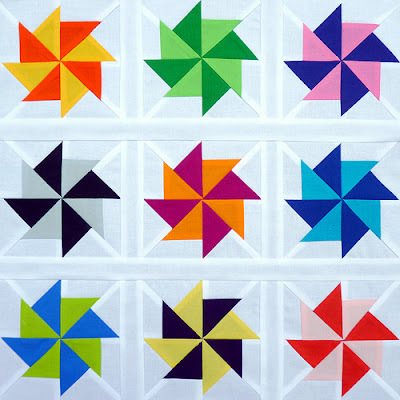 The finished size of each pinwheel block is 5 inches, and all fabrics are Robert Kaufman Kona Cotton Solids from stash. Now ready for some fabric play with some left-over triangles to make a fun quilt back! Flickr Doll Quilt Swap Group ~ Join up! Positively gorgeous! The recipient will be thrilled! I don't suppose I am lucky enough to be your partner but I'd be pleased as punch if I were! I have my fabric now and block in mind but have to get sewing. Wow! This stunning! It looks so nice and crisp too! Stunning! Your technique is amazing...with the white fabric you can see the seam allowance and its so perfect on the back..I love how it highlights the pin wheels which I absolutely love as well! Beautiful. I love how precise your piecing is. 5 inch blocks???? Are you insane? They are fabulous, but 5 inches? Five inches would be okay if it were a one piece block but pinwheels have, what?, 16 pieces. I can't even figure the average size of one piece.....well, yes, I can....TOO SMALL! I am so envious of your swap partner!! It's adorable. What does chuffed mean? ADORABLE. Awww.. Makes me want to pull out my doll collection again. love the blocks .. any chance you can share the block pattern? Whoa Rita....great minds think alike!! :) Flossie and I are both doing that same block for the swap but what's funny is all three of them will be a bit different! Did you see Flossie's drawing....her's has a border. Yes, what does "chuffed" mean, please? Thinking it's good, but . . .
For those of you who have asked the meaning of the word: "chuffed"
Swoon! I am in love with this! Whoever your partner is I am sure she will love it! How do you manage to make everything look so perfectly finished, as if it was created instantly looking so good, and not made by normal sweaty human hands? Love the pinwheels and your colorful combinations! These blocks would perfect for the little triangle trimmings left from making binding strips! This caught my eye on Flickr today. So fun! This is gorgeous! Sadly, I didn't make a mosaic, so I'm thinking this isnt' coming to live with me. :( However, your piecing is perfect! Can't wait to see this completed! Stunning Rita - fabulous mini quilt! Amazing, you accuracy is inspiring! Love,love the blocks,they are absolutely wonderful!! Wow - I love these blocks! I would never have been able to visualize a modern take on the block you linked based on the fabric choices shown... It just confirms that you can take basically any block and modernize it given the right fabric and color choices! Well done!